Charlie turned ten years old today. Three months ago, when he was first diagnosed with cancer, we weren't sure if he would still be alive for his birthday, but his condition has stabilized somewhat in the past few weeks and it now seems that he will surpass our most optimistic expectations. We certainly hope so, because in exactly three weeks, we leave for our Odyssey sailing trip and we'll be gone for three full weeks. If he's not doing well before we go, we're afraid he might die before we return. Everyone we know is aware of Charlie's condition, so our regular network of dog sitters has not been forthcoming and we can't blame them. Nobody would want to have a friend's dog die while they were looking after him. Family is sometimes more sympathetic. My sister Jane has volunteered to take care of him while we're away. The only problem is that she lives in Seattle, more than a thousand miles away. Charlie has never flown and we're afraid it would be overly stressful on him, so I'm going to drive him up there and then fly back to start the trip, then fly to Seattle when we get back and drive him home. The things we do for our pets! When Charlie was still a puppy, Jane gave us a paw print kit as a Christmas present. We set it aside for several years and then misplaced it during our move from Aspen to Grand Junction. Nan spent some time rummaging through the garage last week and finally found it. 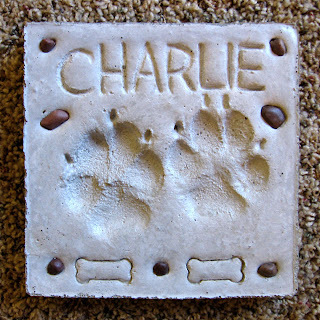 If we were ever going to take Charlie's paw prints, what better time could there be than his birthday? He was fairly cooperative and, as you can see, it turned out just fine for a project that involved working with wet cement. Note the missing nail on the left paw. He lost it tripping on a sidewalk while chasing a tennis ball last fall and it never grew back. I'm sure this plaque will become for us what a child's plaster hand print is for mom and dad, something we'll cherish forever. In the earlier post The Odyssey: Preview, I outlined the route we would be sailing in general terms. 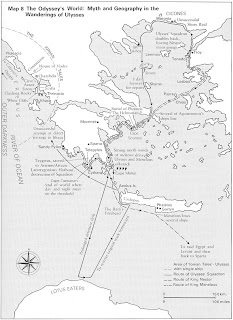 Here is a map from Tim Severin's 1987 book, The Ulysses Voyage: Sea Search for the Odyssey, that shows it in detail. If you right-click on the image and choose "Open Link in New Window", you will be able to view the map in its full size while reading this post in a separate window. Athens is not shown on the map but it is located at the shallow harbor immediately below the "H" in the caption that reads "Burial of Phrontis The Helmsman" near the center of the map. We will start the voyage near there, at the Alimos Marina in Kalamaki, about five miles south of the Acropolis. Capt. John Kretschmer will have his Kaufman 47 cutter-rigged sailboat, Quetzal, waiting there for us and the other crew members for our April 23 departure. After rounding Cape Sounion and sailing through the Doro Channel, which is marked on the map with the caption "Several of Agamemnon's ships lost", we will continue northeast on an overnight passage to Turkey, landing in Ayvalik, on the mainland due east of the island of Lesbos. We will then sail north along Turkey's coast to the ruins of ancient Troy. At this point, our route should closely match the solid line on the map that depicts the route of Ulysses' squadron through the Aegean and Cretan Seas, until we reach the leg marked "Prolonged defensive drift". We will not be sailing to Africa to explore the Land of the Lotus Eaters. As Capt. John has said, "I am searching for the spirit of Odysseus as much as anything." So we will detour to the south coast of Crete, the large island between Greece and Africa, and pick up the route again there. We will explore the land of the Cyclops and then sail northwest to the Peloponnese peninsula of Greece, following it north into the Ionian Sea and on toward Ithaca, Ulysses' home. The voyage does not end there because Ulysses was unsuccessful in reaching Ithaca on his first attempt and was blown all the way to Circe's island of Aeaea, which we will also not be visiting. Instead we will explore the islands north of Ithaca, which figure into the Ionian Tales section of Homer's Odyssey, and finish the voyage at Corfu, the island below the "Phaeacia" caption on the map. Captain John has installed a SPOT beacon on Quetzal which will relay our position every day to a service that sends out email notices with links to Google Maps. If you would like to receive those notices and follow our voyage as it happens, please send me a quick email message at johnlichty@bresnan.net and I will put you on the list. Thank you for sharing your interest. Science fiction writer Arthur C. Clarke has died. All through the day today, my thoughts kept returning to him and his influence on my life. On a winter weekend day in 1968, when I was ten years old, my father packed the whole family into the station wagon and drove us to a movie theater in downtown Milwaukee to see 2001: A Space Odyssey. It was shown on a giant curved screen that made you feel like you were inside the movie. I don't think my father knew what to expect, taking my mother, my younger siblings and me to what is a serious adult film. Even he didn't know what to make of the loud psychedelic scene near the end when astronaut Dave Bowman is hurtling along at tremendous speed in his space pod one second and then has suddenly landed in a large beige-colored bedroom the next. I didn't understand it either, but it changed the way I thought about the future: Boy, are things ever going to be different in 33 years! I saw 2001 again a few years later with my friend Mark Wiars at the Tosa Theater, just the two of us. We both thought it was cool as heck but we still didn't get it. What was up with the obelisk? Was the one the pre-humans encountered the same one the astronauts found on the moon and then later floating in space? It never occurred to me that there might be a book based on the movie's screenplay until I saw it in my high school library. It answered all my questions and got me hooked on science fiction. My friend John Shepherd was reading lots of science fiction at that time, but I couldn't get into some of it because it was too fantastic and implausible. 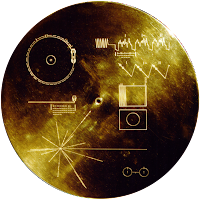 I was more interested in stories that followed the laws of physics and yet imagined wild futures full of extra-terrestrial encounters and technological marvels, which is exactly what Arthur C. Clarke provided in his "hard" science fiction. To this day, I am much more interested in seeing a movie like Alien than I am in seeing Star Wars. Over the years, I have read almost all of Arthur C. Clarke's fiction. Most recently I read a collection of short stories that included The Sentinel, which was first published in 1951 and was the inspiration for 2001: A Space Odyssey. In 1983, when I bought my first computer, a Commodore 64, it included a built-in version of the BASIC programming language. I had struggled with FORTRAN in engineering school, but BASIC clicked for me. I started writing programs to balance my checkbook, calculate pi, wake me up in the morning and do all sorts of other pretty worthless things. Then a friend gave me a printout of the code for ELIZA, the artificial intelligence program written in 1966 by Joseph Weizenbaum, who died earlier this month. The program is designed to respond intelligently to the user's input, simulating a conversation between the user and the computer. It took several nights, but I transcribed the entire thing into my computer and started playing around with it. The program reminded me immediately of HAL, the mutinous computer from 2001, so I rewrote it with HAL's personality. If it couldn't come up with an appropriate response, it would say things like, "Dave, my mind is going..." or "I'm afraid I can't do that." What I discovered by working with these programs was that I had a knack for computers and programming. They made sense to me. So I pursued a career in information technology that started back in 1985 and continues to the present. I am currently the Database/Internet Administrator for Aspen Valley Hospital. In a way, I owe it to Arthur C. Clarke for opening my eyes to a future where anything, within the confines of science, is possible. Thank you, Mr. Clarke. My work encourages me to attend training seminars once in a while to keep up with technology developments. Since there aren't many educational opportunities of this type in western Colorado, I usually need to travel at least as far as Denver. Last July, the closest location for the class I wanted to take, in Microsoft SQL Server 2000 database administration, was in Phoenix. I gave some consideration to the idea of being in Phoenix in July, but I thought, how bad can it be? It's a dry heat, right? And I'll just be driving an air-conditioned car from my air-conditioned hotel room to the air-conditioned training center. Well I'm here to tell you that it's hot in Phoenix in July, no matter how much you try to avoid it. It turned out that my hotel was just six blocks from the training center, so I decided I should walk back and forth for the exercise. This wasn't so bad in the morning, but one afternoon on the walk back it was 112 degrees. I had never experienced heat like that except in a sauna. It made my eyes wobble. Or maybe it was just the heat waves radiating off of everything. When I made it back to my room, I had to take a cold shower just to get my body temperature back to normal. A major reason I wanted to attend a training in Phoenix, even in July, was that one of my best buddies from high school, Gene Hanson, and his wife Cindy live there. I arranged to fly in early on the Saturday morning before the training's Monday start so we could spend some time together. 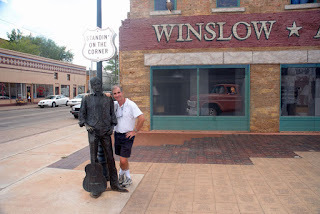 Even though they live within easy driving distance, Gene and Cindy had never been up to Winslow to see either the Eagles "Take It Easy" tribute or the nearby Meteor Crater, so I suggested that we do exactly that. Gene was up for it but Cindy was not. Just the geeks then! so open up, I'm climbin' in, take it easy..."
Winslow seems to have only three things going for it: the railroad runs through it, Route 66 used to run through it, and the Eagles mentioned it in a song. It's a pretty grim little town otherwise. They did a nice job with the tribute, combining a three-dimensional statue with a two-dimensional mural. Here's Gene posing with Take It Easy guy while the girl in a flatbed Ford looks on from the reflection in the painted window. The paving stones contain the names of the people and businesses who contributed to make it all possible. Ready for anything, Gene has all his camera equipment within easy reach at the north rim of the Meteor Crater, about 20 miles west of Winslow on I-40. We didn't know what to expect when we got there. I had seen "Starman", the 1984 movie starring Jeff Bridges and Karen Allen, which has its climax at the crater. That scene made the area look pretty rustic, like there was nothing manmade out there, not even a fence. So we were pleasantly surprised to find a first-class visitor center, with a museum, an American Astronauts Wall of Fame and Apollo space capsule, paved walkways, observation platforms and everything else you would need to complete the experience. Quick history: About 50,000 years ago, a meteor weighing hundreds of thousands of tons blasted through the atmosphere above what is now Paris, France. A mere six seconds later, it crashed into the earth at this spot, killing all life within an area about the size of Arizona. 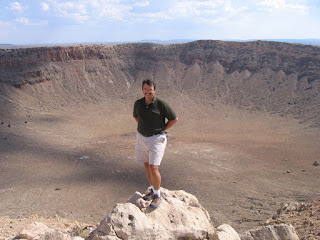 In the early 1900s, when area settlers determined that the crater was not a sinkhole or extinct volcano but rather an actual meteorite crater, they excavated in search of the meteorite to claim its iron, but it was never found. "Why do you think that was?" Gene asked. "Did it vaporize on impact?" I asked. "No," he said. "It was moving so fast when it hit the earth that it punched right through the crust and into the mantle." It boggles the mind to imagine that level of destruction. And this is considered a minor impact compared to the one that wiped out the dinosaurs. 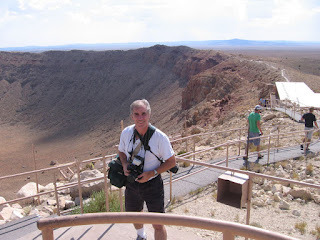 Gene using the observation scope to check out the bottom of the crater, which is 550 feet deep and 4000 feet in diameter. The Apollo astronauts did some training here, and there is now a life-size plywood cutout of an astronaut with an American flag down at the bottom, but you can't see it without binoculars or a telescope, which gives a good idea of the scale of the crater. It's huge! 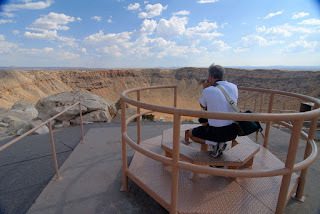 One of the Meteor Crater rangers getting a group together to do the out and back rim tour. Note the two gallon jugs of water--it's hot out there! 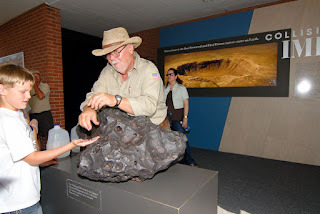 He's leaning on a cast of an actual meteorite. Also note the aerial photo of the Meteor Crater in the background. The Visitor Center is that tiny square just northeast of the woman's shoulder. Again, the scale is just incredible. 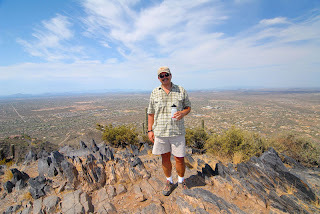 The next morning, Gene and I began our tour of the local hikes that he does to stay in shape for his Grand Canyon hikes. He and a friend hiked/ran from the North Rim to the South Rim in one day a few years ago. You can see photos of the event on Gene's website. 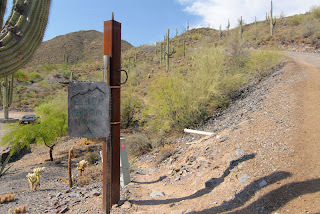 This is the start of the Black Mountain Trail, as indicated by the sign. That's the peak of Black Mountain immediately above it. Note the saguaro cacti on the hillside. 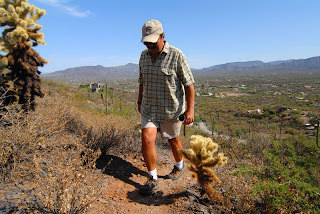 Hiking up the Black Mountain Trail past a bunch of teddy bear cholla. Don't let the name fool you; you wouldn't want to touch these teddy bears. It's only about 9:00 in the morning but the temperature is already in the high 90s. Totally sweated out and standing on top of Black Mountain, a giant pile of fractured basalt. Behind me is a view looking southwest down Cave Creek Road. 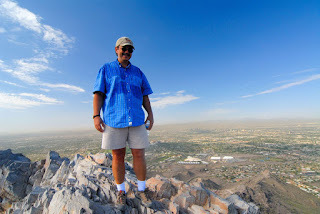 On Tuesday morning, Gene took me over to probably the most popular hike in the Phoenix area, Piestewa Peak (formerly Squaw Peak). 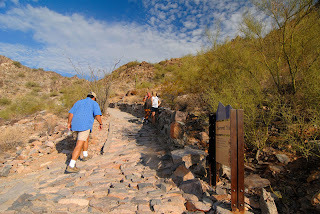 It gets so much traffic that sections of the trail are covered with local stones laid like paving stones. Gene says the gentleman in the tank top talking to the woman in the white t-shirt is there every day, going up and down as many as three times. The higher you go, the steeper it gets. This section of the trail is the final steep stretch before the summit. At least it was in the shade. 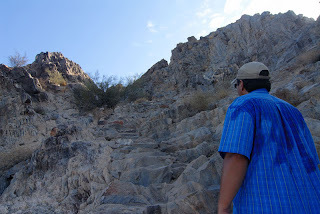 Totally sweated out and standing on top of Piestewa Peak, a giant pile of fractured granite. That's downtown Phoenix in the distance behind me. 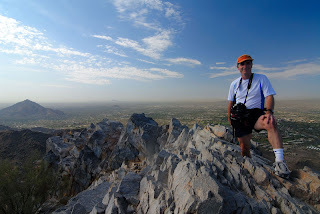 Not-so-sweated-out Gene at the top of Piestewa Peak. I swear, the guy doesn't sweat at all, even carrying all that camera equipment. That's Black Mountain in the distance to the north, our hike from Sunday morning. 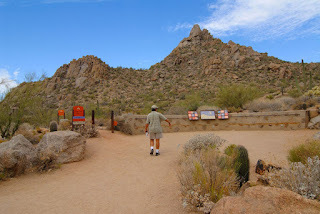 The trailhead for the Pinnacle Peak hike, which we did on Thursday morning. This hike would not take us to the top, which looks like it would be a fairly dangerous climb, but rather over the shoulder and around the backside for an out and back, some of it in shade. 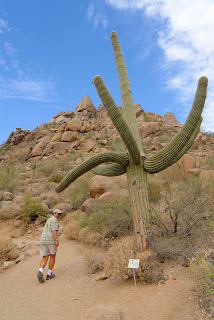 Attack of the giant saguaro! 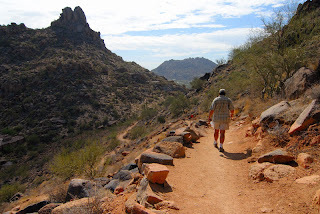 On the backside of Pinnacle Peak, showing the gentle trail leading to the looming switchbacks in the shadow of the peak. Gene likes to take what he calls "critter shots." 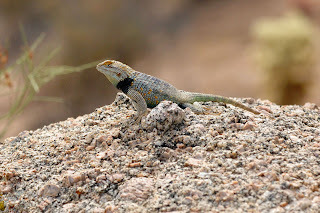 This one is of a yellow-backed spiny lizard (Sceloporus uniformis) that we spotted while going up the switchbacks in the previous photo. He doesn't appear to be affected by the heat. Me, I was happy to get back to the relative cool of Grand Junction at the end of the week. The last weekend in November, I was searching for Valiant 40 sailboats online and looking beyond the OffshoreYachts.com and YachtWorld. com listings I routinely checked, when there she was: Sea Hawk! The very same boat I had motored past in Fort Lauderdale with John Kretschmer in January of 2007 (see Boat Quest, Part 7). The listing was brief, just a single photo (the one above), a list of features and a price of $49,000, but it included the phone number I had miscopied ten months before. I vacillated a few days and then called the number. No answer. I left a message saying I knew the boat and I knew John Kretschmer and I was interested in finding out more. I waited a few days but never got a call back. I called again and got in touch with Harvey, the owner. He apologized for not calling back; he had just returned from the Bahamas. We talked for twenty minutes about how we each knew John, and about Sea Hawk and what was going on with her. Harvey listed off the included sail inventory and custom equipment, and said he was in the process of replacing the existing Westerbeke diesel engine with a rebuilt one. It sounded like a big project. I asked why the price was so low. He said that Sea Hawk was one of the Valiant 40 "blister boats" but that unlike most of the others with the blistered fiberglass on their hulls and topsides, hers had never been repaired. I knew the problem was purely cosmetic so I wasn't put off by it. The idea of buying a Valiant 40 for only $49,000 was too exciting. Harvey asked when I could fly down to take a look. I hadn't thought that far ahead yet and said so. He suggested I contact John and have him take a look on my behalf. I said I would and asked if there were any other photos I could look at in the meantime. He said he would email me some. We agreed to stay in touch and ended the call. I emailed John to tell him I had found Sea Hawk online and ask if he would be willing to drop by to take a look at her. He replied that he would. John is the author of Used Boat Notebook: From the pages of Sailing Magazine, reviews of 40 used boats plus a detailed look at 10 great used boats to sail around the world, so if there was anybody whose opinion I could trust, it was his. He called me after he had had a chance to talk with Harvey and look at Sea Hawk in person. He said that Harvey was still in the process of replacing the engine but that even with the mess involved in that project, she still looked "really rough." This surprised me. I said that I had closely studied the 49 photos Harvey had emailed me and that she didn't look too bad, maybe just the victim of deferred maintenance that could be rectified with solvent, varnish and plenty of elbow grease. He said if I was really interested I should fly down and take a look myself. So I emailed Harvey and asked when he would be available during the upcoming weeks, by this time late January to early February. He didn't respond. I figured he was in the Bahamas again. About this time, in mid-January, we made the trip to the Animal Cancer Center in Fort Collins to get the diagnosis on our dog Charlie's cancer. When we found out how serious it was, Nan and I agreed to postpone any trips to Florida for now. The boat could wait. It was more important to be home taking care of Charlie. Harvey finally emailed me back a couple of weeks ago. He had spent all of February in the Bahamas, but he was back and available if I wanted to fly down and see the boat. This time it was me who didn't respond. 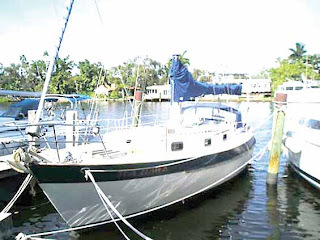 I just checked the listing site, SailboatTraderOnline.com, and Sea Hawk is still available for sale. We were in Moab, Utah over the weekend so Nan could run in the Canyonlands Half Marathon, like she does every year. While she was racing on Saturday morning, Charlie and I hiked the Hidden Valley trail just south of town. 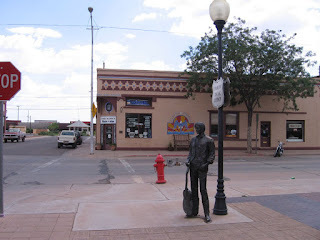 We like it because it's dog friendly, unlike the nearby Arches and Canyonlands National Parks, and it's usually not too crowded because it starts with a grueling rocky climb. 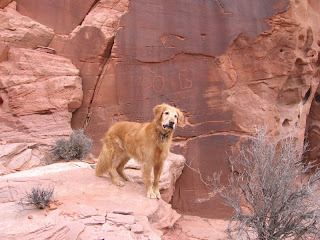 The photo shows Charlie at our turnaround spot, a wall of ancient petroglyphs about two miles from the start. Click the photo for a larger version that shows the petroglyphs better. As we were walking, I paid careful attention to Charlie for signs of his mouth bleeding or his endurance flagging, and I stopped frequently to squirt water from my CamelBak for him to drink. With his cancer, I wanted to make sure he didn't overexert himself. Fortunately, it was a cool and overcast morning, so the usual desert heat was not a factor. We have done this hike in the past when it was so hot that Charlie would stop and rest in every patch of shade. Naturally, as I followed him up the trail, I was thinking about Charlie and his cancer, and something occurred to me. Charlie is one of those golden retrievers who spends about half of his waking life with a tennis ball in his mouth, or at least he did until we took them away to avoid aggravating the tumor in his mouth. I wondered if maybe the tennis balls had something to do with his cancer. Is there some chemical in them that is carcinogenic? A freshly opened can of tennis balls certainly smells toxic, but are the contents actually harmful? I searched on Google for "carcinogenic tennis balls" but not surprisingly, there were no good matches. I think this was a kind of wishful thinking, a need to know the answer to the question of why this has happened. The veterinarians say there is no answer, but there's still a nagging feeling of guilt and regret: if only we had done something differently in Charlie's life, none of this would have ever happened. That's the problem with "why" questions. Even if we knew the answers, they wouldn't change what has already happened. All we can do is cope with the present situation as best we can. Since our dog Charlie was diagnosed with cancer two months ago, we have spoken with many pet owners who have had similar experiences. Their dog or cat was doing just fine and then one day there was a lump, or bleeding from the mouth. Within a few days, weeks or months, their beloved pet was dead, often before reaching ten years of age. It seems that pets who live long healthy lives and then die of old age are the exception these days, but I can't remember this always being true. All these tragic early deaths make me wonder what the cause might be. Have we poisoned our environment so terribly that it is killing our pets? I know that Charlie will eat anything that seems remotely edible, including grass, sticks and garbage, so is it possible that his eating habits have resulted in the osteosarcoma growing in his upper jaw? The half-dozen veterinarians we have consulted don't know why he has it, and they're frankly surprised to see a cancer that normally attacks appendages take hold where it has. He has been through two chemotherapy treatments now, but they don't seem to be helping. The tumor in his mouth cavity has been removed twice, but it keeps regrowing and is now the biggest it has been, about the size of my thumb. Charlie had a clear chest x-ray yesterday, indicating that the cancer has not yet spread to his lungs. He is scheduled to have the tumor "debulked" again tomorrow, and he is scheduled for a third chemotherapy treatment next Thursday. We're hoping the treatments will prevent, or at least slow, the growth of the tumor and the spread of the cancer, but based on what we have seen so far, that doesn't seem likely. If our pets, who live protected, supervised lives, are being poisoned by the environment, what does that say for wildlife? What chance does it have fending for itself? No wonder we're losing species to extinction at a record rate. What about humans? Will the diseases resulting from our poisonous environment eventually outpace developments in medical technology and reverse gains in life expectancy? If the early deaths of our pets are any indication, we would know that we are already in deep trouble. The canary is already dead.